Elliston is a tiny, remote town at the tip of the Bonavista Peninsula in Newfoundland Canada, a few clusters of clapboard houses and narrow meandering streets that cling to craggy dark cliffs that drop fiercely into the booming waves below. Salty winds blow constantly across the landscape with a relentlessness that fits perfectly with the well-told depiction of Newfoundland as a place of harsh beauty surrounded by a remorseless ocean. In many ways Elliston is a typical Newfoundland town that, once a busy fishing settlement, lost its primary industry with the collapse of the cod stocks in the nineties. Then, like much of Newfoundland, the town turned towards tourism as a strategy for new economic growth. Unlike official provincial schemes, however, the tourist attractions of Elliston are decidedly local, clearly initiated by enterprising residents hoping to bring some portion of Newfoundland’s hundreds of thousands of visitors towards this part of the island. 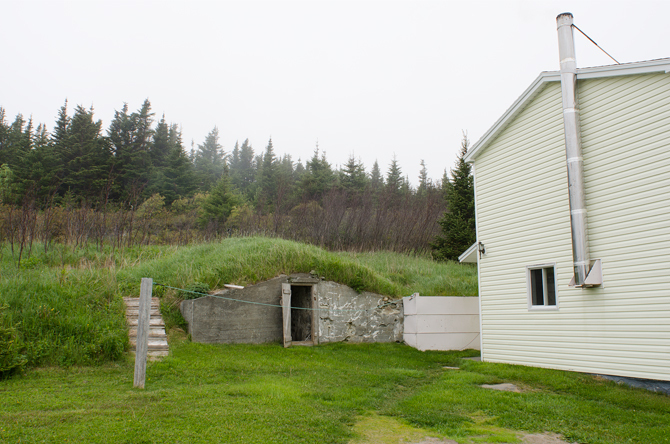 In 2000, Elliston declared itself the “Root Cellar Capital of the World,” hoping that the numerous sod-covered structures dotting the landscape made them unique enough to warrant a visit. 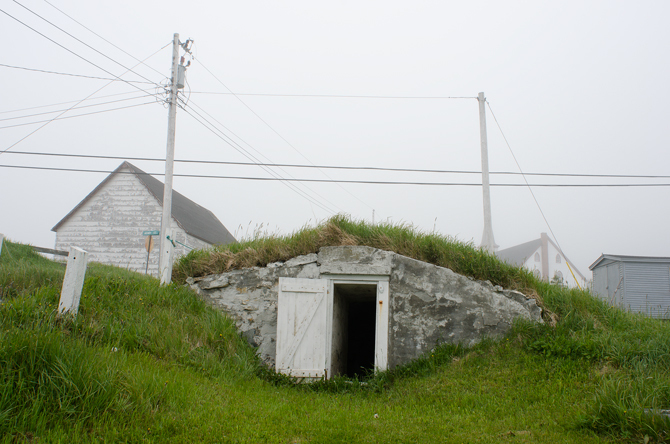 The town counts over 130 root cellars across the town and surrounding terrain. The earliest are over two hundred years old but there are many that date from the 1950s since some parts of the town were without electricity until the early 60s. Most of the cellars remain in obvious relation to individual houses, though some of the older ones were built into the sea-side face of the cliffs—presumably for the wind’s cooling effect—and others, mostly grass covered, seem to have outlasted whatever structure it was they once served. 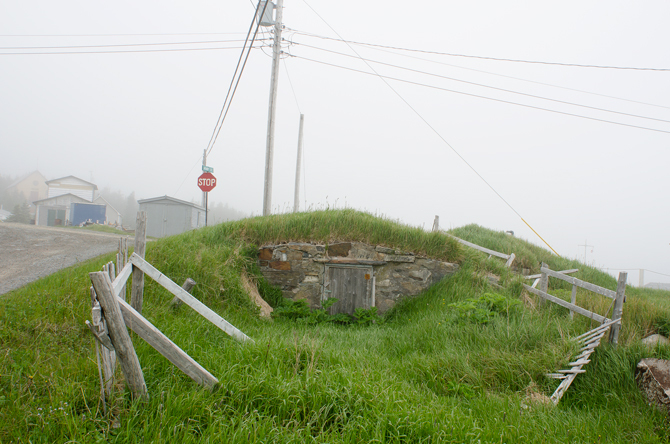 These root cellars were once a critical part of life in Elliston, helping residents survive in the remote location and difficult terrain during a time without electricity and no local agricultural supply to rely on, keeping vegetables and other provisions warm during freezing winters and cool in the summer months. The tourism effort involved mapping the cellars, restoring some of the structures in anticipation of visitors, creating interpretive signage, and opening a local restaurant focused on the foods that were traditionally stored in the cellars. 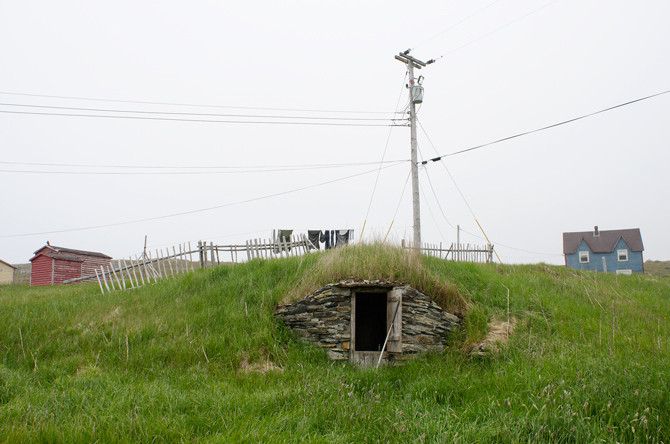 The hope behind this initiative seems to have been that those interested in subsistence living would seek Elliston out in order to learn about the logistics of an era when all food was locally sourced and self-reliance critical to survival. 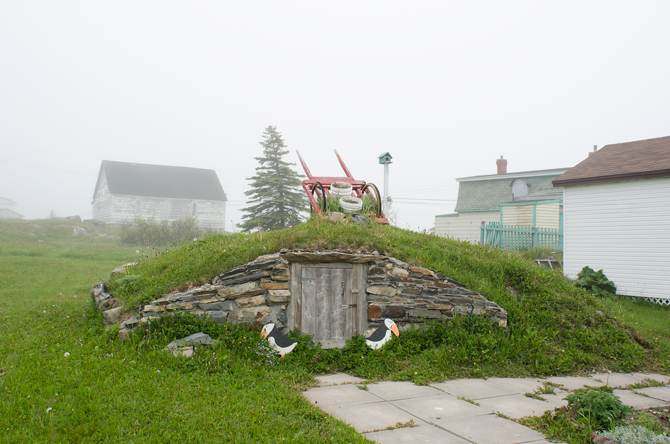 But, in the years that followed its launch, the energy behind the root cellar initiative seems to have waned, and the town has refocused its efforts on more popular attractions, particularly a colony of puffins visible from a much-visited point of land just outside of town. The map is still available and the “Root Cellar Capital of the World” sign remains prominent. The root cellars of course persist, popping up across town in various states of usage and repair. But, the restaurant is closed and a cellar visitor is unusual enough to warrant curiosity from residents. The artifacts of this project are themselves beginning to seem like traces of an earlier moment—a moment of great optimism and intrepid, if eccentric, vision—which though perhaps unsuccessful as a tourist draw, continue to bring attention to the lingering infrastructure of the root cellars. Even with the waning of the tourism scheme, the persistent structures continue to serve the residents of the town, not as curiosities but in their original function. 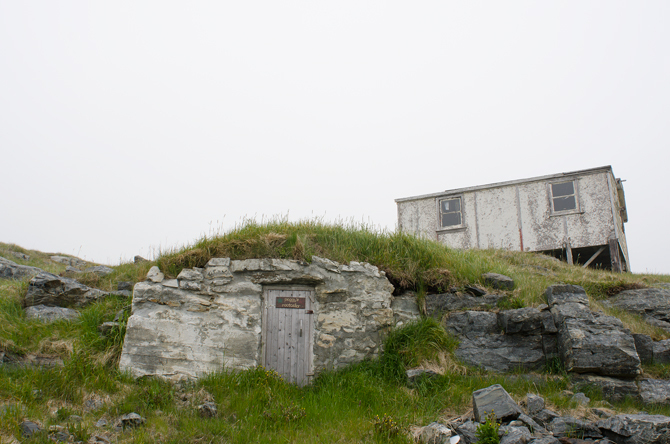 Though now made redundant by electrical appliances, many of the root cellars remain in use, allowing residents to stock healthy foods in an economical and reliable way — surely still a convenience in such a remote location. As supply and demand systems get ever larger and more complex and our reliance on them grows, the simple self-reliance of the root cellars seems both elegant and novel. 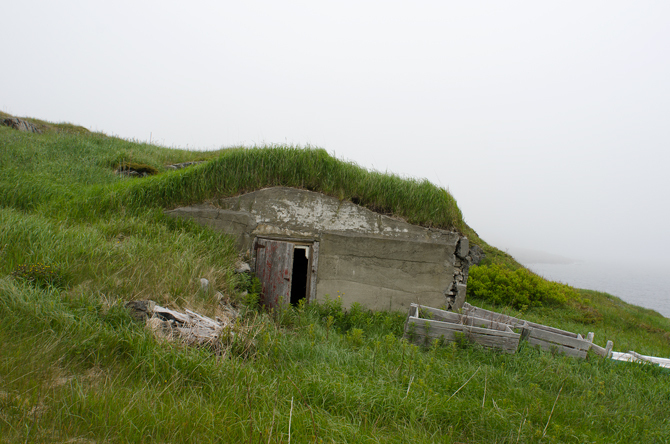 Especially when viewed within the context of a collapsed natural resource economy, the old root cellars together with the newer traces of the local tourism initiative form a compelling narrative that points to the importance of resiliency in the face of changing circumstances. In Elliston it is easy to wonder about the level of impairment a collapse of infrastructural systems could bring. In such an event it could very well be traces of older technology we turn to. Even without collapse, the remnants of earlier systems provide us with alternatives, ways of opting out of prodigious networks that leave us reliant on them. Lisa Hirmer is an artist, writer and designer based in Guelph, Ontario, Canada. Her work can be divided amongst two main practices, though the thematic overlap is significant: She is an emerging photographer and writer producing work that reflects her background in architecture and is primarily concerned with examining material traces found in complex or hybrid landscapes, especially those that act as evidence of unseen forces. She is also a co-founder and principal of DodoLab, an experimental arts-based practice that has been producing innovative public research and socially engaged projects since 2009.